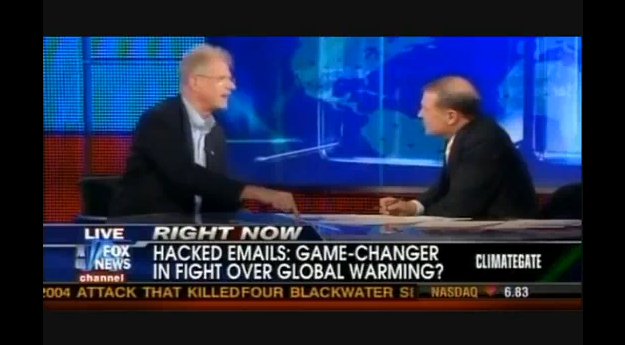 So to see the power of likeability and celebrity, let’s take a look at the semi-famous debate over global warming that was staged (with emphasis on the word “staged”) in the spring of 2007 in New York City by a group called Intelligence Squared. In retrospect, the event was sort of a mess which most people who are worried about global warming would prefer to forget. I spoke to numerous people who attended the event, or were part of the two panels debating whether global warming “Is not a crisis” (which seems to be an odd way to phrase it as you end up having to combine positives and negatives by saying either, “Yes, it is not a crisis,” or “No, it is”). There were many complaints about how unfair the entire event was, ranging from the possibility that the audience was already stacked with skeptics, to who chose the panel members. As I said, many would prefer to dismiss and forget the event, but I am of the opinion that we are constantly headed into new territory with the communication of science in today’s rapidly changing media environment, and so it’s crucial everyone is brave enough to be willing to learn from their mistakes (including me, and I’ve made plenty). I mentioned this event in my book in reference to a statement made by one side that was perceived as unlikeable (i.e. condescending) and may have changed the outcome of the event. But there’s lots more to be learned. In the making of my movie “Sizzle,” I spoke with one of the “global warming IS a crisis” panel members who told me that the event began and ended that evening when one person entered the room. That person had both of these powerful mass communication elements on his side — both likability AND enormous (both in reputation and physical stature at six foot ten) celebrity. The fellow he was talking about was science fiction author Michael Crichton. 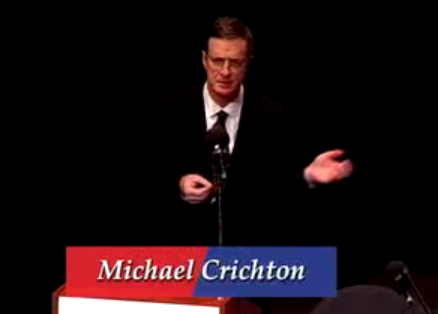 Actually, in many people’s opinion, that label “science fiction author,” tells us as much as we need to know about Crichton — that he was not a climate scientist but rather an expert at spinning yarns built around pieces of science. But as several other people I’ve spoken with who were there that night said, the entire audience was starstruck by Crichton. And thus the debate was over before it began. Being persuasive is what debating is about. Two sides go at it, each trying to persuade the audience. Which means that when a television news talk show contacts your organization saying they are looking for someone to “debate” a global warming skeptic, who are you gonna give them? Ideally someone with strong powers of persuasion. If you are certain that the only people who are going to watch this television news show will be highly educated, long attention span academics, then you should find a spokesperson who is just really, really smart (and this might actually be the case for a snoozeathon like The Lehrer News Hour on PBS). But if we’re talking about mainstream TELEVISION … well, it’s a superficial medium, so you probably should go for these other elements, namely a person who is likeable and ideally a celebrity. This dilemma popped up a number of times in the past two months around the Climate Gate issue. Here are two factors to consider. I was hit by this revelation in 1989 and it was part of what compelled me to pursue my interests in filmmaking. The vast majority of Americans go to the movies or turn on their televisions sets at night not to get smarter, but for one main reason — to be entertained. That’s it. Yes, there is this small sliver of highly educated people, or folks seeking an education through television, who do in fact turn on their TV set to learn something, but they aren’t the masses. And the television ratings support this notion. People just want to be entertained. The Daily Show and The Colbert Report figured this out long ago. They realized it is still possible to do a fair amount of education through television, you just have to keep that agenda secondary to the entertainment. So if you’re able to accept this basic element of mass communication, then why would you think today’s “news” shows (which are mercilessly ridiculed by The Daily Show for their superficiality) would be any different? And especially when you watch the shows and see their over-the-top nonsensical graphics with all the color and whooshing and elements flying around … why would you send a smart person into battle on such a stoopid venue? In that completely rational arena, the forces of rationality prevailed. But public “debates” and television news talk shows and late night wine-sated discussions in bars are not rational venues. The rules are different. And to win in these venues takes a different set of skills. It’s time for the science world to at least understand this much. SO WHO YOU GONNA CALL when Fox News says they want a spokesperson for global warming? You want my honest opinion? Call Ed Begley, Jr. He’s likeable. He’s a celebrity. He knows he’s not an expert on climate science. He knows how to point you to the experts. And he knows how to match their irrationality, point for point, by throwing his irrational force (emotion and humor) back at their irrational force (distortion and hyperbole). He gave what I felt was the very best television performance around the Climate Gate issue back when it first broke. Of course all the right wingers attacked and ridiculed him for “losing his mind,” but that’s because they were frustrated at not having their usual easy opponent — a fact-filled, dead serious scientist or environmentalist that they can spin circles around. Did he “win” the “debate”? Not by any stretch. But he also definitely didn’t “lose” it. With a spokesperson like him the worst outcome is just a tie. Whereas with a major knowledgeable scientist the worst outcome is to be perceived as having “presented the case,” and lost. You want to see what they prefer to have for an opponent? Just watch any television news show “debate” involving Marc Morano (former spokesperson for Senator James Inhofe, now the loudest and most aggressive mouth for the climate skeptics with his Climate Depot website). He’s had several. I don’t want to name his opponents, but they have ALL been chewed up and spat out by him. ALL of them. And here’s the clincher — guess who the booker on The Colbert Report says they want as their guests. Last spring I attended Book Expo where Emily Lazar, the person who books their guests was on a panel discussion. She said they basically want stiffs — dull, dry academics who are not “self-aware” — which means they lack humor and emotion. Her basic rule of thumb was, “There’s only room for one comedian on the show.” Think that through. They want highly rational people that Colbert can easily spin circles around. They want THE EXACT SAME PEOPLE that Fox News and Marc Morano want. As I said, it’s TELEVISION! After doing two movies on the anti-science movements attacking evolution (“Flock of Dodos”) and climate science (“Sizzle”) I developed my own little pet subtitle for both movies which is, “The Cub Scouts Against the Mafia.” It’s not meant to be an insult against the science/environmental side. In general they are very, very good people with the best of intentions and a whole lot of passion (just like Cub Scouts). But in the increasingly vicious world of mass communication, they are children lost in the woods. The anti-science side showed their true colors clearly in December when they not only committed a dishonest act (stealing emails from a research institution), but had no compunction about using such dirty and unlawful tactics to make their case. The “mafia” label is not that much of a stretch. For the issue of global warming we put together a lightly humorous graphic to highlight ten of the top characters on both sides. It may seem like I’m ridiculing this issue, but I’m not. I’m very serious (in Gore’s words on South Park, “I’m super cereal”). The two sides are grossly mismatched and the science/environmental side has simply failed to take their opponents seriously enough. It began with Al Gore dismissing the opposition in his movie, “An Inconvenient Truth” (similar to how John Kerry tried to ignore the Swift Boat Veterans). It was further complicated by the major environmental organizations following Gore’s cue and choosing to also “focus on the positive” by ignoring the painful and messy topic of climate skeptics. And finally manifested itself with the entire Climate Gate fiasco last month for which the science/environmental side did a haplessly inept job of responding to a major attack on their credibility. 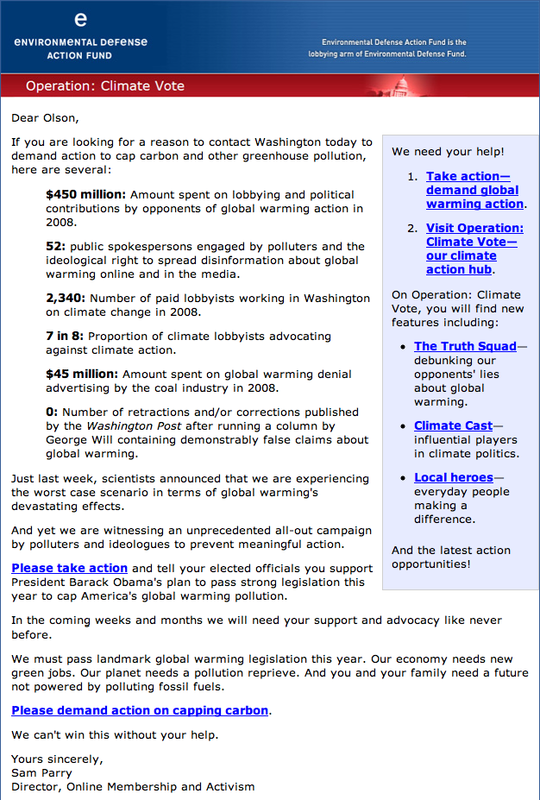 Mass email from Sam Parry of Environmental Defense Fund stating the ugly truth about how large the cliimate skeptic movement has become. How could it have all gone better? Very simple. If Al Gore had mentioned, in “An Inconvenient Truth,” the potential seriousness of the attacks on climate science (see above, in 2008 Environmental Defense Fund said over $450 million was spent to attack climate science and climate action) and sounded an alarm, the science and environmental world could have come together to assemble a task force to address this issue three years ago. And what could have emerged from that might have been a sort of SWAT Team of communication experts, available on 24/7 notice, ready to assess a situation and head it off immediately with rapid action. And their action wouldn’t have to involve ANY “spinning,” lying, or dishonesty. It would only need to involve experienced, big time communication strategists, rather than the earnest science bloggers who became the first line of defense in the Climate Gate mess. And where would you find such experts? Maybe start by calling baseball fiascoist Mark Maguire. He can give you their numbers (as detailed recently in the NY Times) They exist. They would have had the ability to actually pull together a sophisticated COMMUNICATION strategy (not a science strategy) to deal with the attackers of science during Climate Gate, instead of once again just hoping they would go away. Of course they aren’t cheap, but what price do you put on the public’s faith in the entire profession of climate science? Are you even able to grasp that right now the credibility of the climate science community with the general public has been damaged? Is there any value in even doing climate science if the public is going to dismiss it? The world of communication has changed. There needs to be new approaches. * – Sean Carroll was an effective spokesman for the 60 Minutes segment because it’s a fairly rational venue run by fairly rational people. But he might not be your man for Fox News.